Elliott Royce was a well known and colorful man about town for many years in St. Louis Park. He was incredibly active into his 90s and was known for his many volunteer activities. One of his greatest contributions was teaching elderly people how to fall safely; he practices falling every day. There are countless stories and tributes which are captured on this website managed by his family. 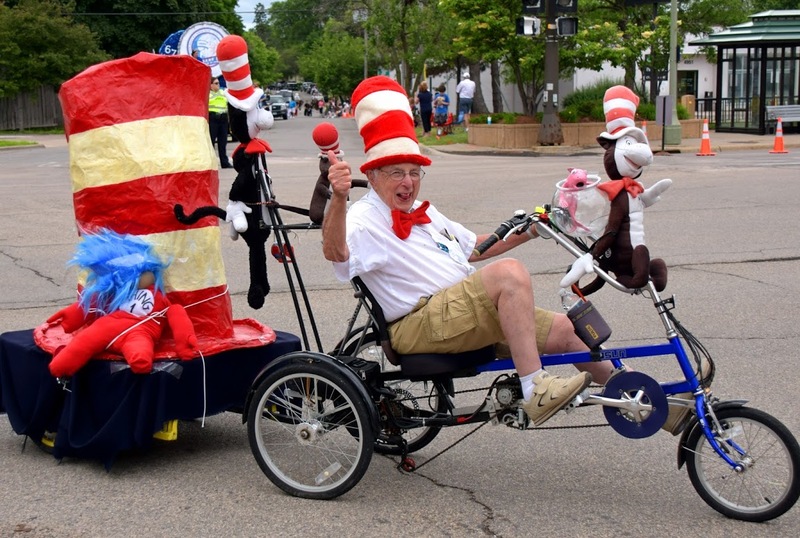 Elliott could be seen around town riding his recumbent bike, often wearing a Dr. Seuss hat and carrying a “Cat in the Hat” or two. It was his trademark and the kids (and adults) loved it! Elliott died at age 96 on July 17, 2015; he had recently run a marathon. More than 400 people attended his funeral services which is a testament to his popularity and the depth to which he connected with so many people around the city. The Historical Society was gifted Elliott’s famous bicycle and will work with the City and Family to find a appropriate and meaningful way to display it so that his spirit of community and charity will continue. Elliott Royce, the youngest of three boys, was born in Eitel Hospital in Minneapolis. He graduated from West High School in Minneapolis in the 1930s, and studied pharmacy at the University of Minnesota. Royce served in the Navy during World War II. In the lead-up to the war, he learned how to fly an airplane and later taught others. His family owned pharmacies. After the war, Royce worked in the family’s new business stocking grocery stores and gas stations with items like toothbrushes that previously were available only at the drugstore, said his daughter, Sandie Kaster. In time, he left the family business to start his own company in commercial and industrial real estate. Financial success allowed for philanthropy, Kaster said, noting how her father organized the shipment of instruments to music students in Israel.